Visual Studio Code>Other>GitLab ExplorerNew to Visual Studio Code? Get it now. 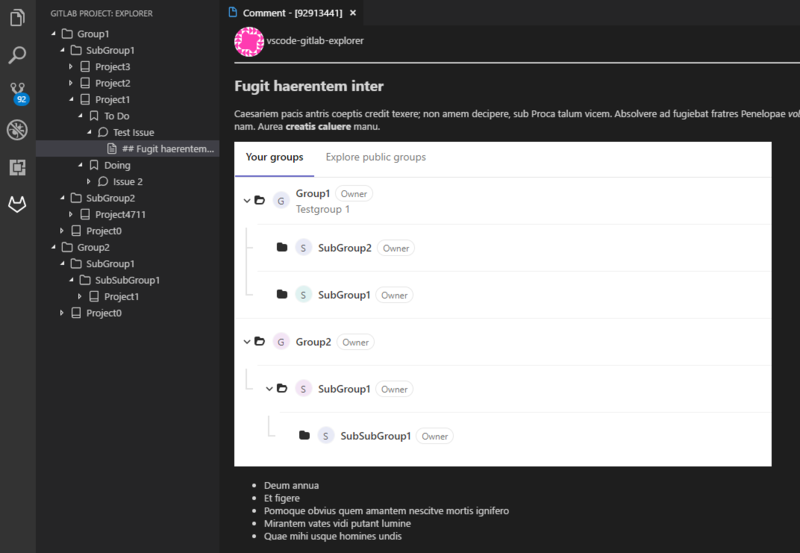 VSCode GitLab Explorer Extension to Work with GitLab Project Items like Groups, Projects, Issues etc. VS Code extension for working with GitLab Project Items, supporting both GitLab.com and custom GitLab Servers. Explore your GitLab hierarchy with Groups, Projects, etc..
gitlab-explorer.personalToken: Personal access token to use the GitLab API. To create a gitlab-explorer.personalToken with api Scope follow the instructions in the Gitlab documentation. If gitlab-explorer.serverAddress is not set, it use Gitlab.com by default. Its also possible to use a ReverseProxy or SSL Offloading.